With its emphasis on cooking with all the senses, The Breath of a Wok brings the techniques and flavors of old-world wok cooking into today’s kitchen, enabling anyone to stir-fry with wok hay. IACP award-winner Young details the fundamentals of selecting, seasoning, and caring for a wok, as well as the range of the wok’s uses; this surprisingly inexpensive utensil serves as the ultimate multipurpose kitchen tool. The 125 recipes are a testament to the versatility of the wok, with stir-fried, smoked, pan-fried, braised, boiled, poached, steamed, and deep-fried dishes that include not only the classics of wok cooking, like Kung Pao Chicken and Moo Shoo Pork, but also unusual dishes like Sizzling Pepper and Salt Shrimp, Three Teacup Chicken, and Scallion and Ginger Lo Mein. Young’s elegant prose and Richardson’s extraordinary photographs create a unique and unforgettable picture of artisan wok makers in mainland China, street markets in Hong Kong, and a “wok-a-thon” in which Young’s family of aunties, uncles, and cousins cooks together in a lively exchange of recipes and stories. A visit with author Amy Tan also becomes a family event when Tan and her sisters prepare New Year’s dumplings. Additionally, there are menus for family-style meals and for Chinese New Year festivities, an illustrated glossary, and a source guide to purchasing ingredients, woks, and accessories. Stir Frying to the Sky’s Edge, winner of the James Beard International Cookbook Award, is a comprehensive guide to the art of stir-frying that offers detailed instructions for making all the classic stir-fries—dry, moist, clear, and velvet. Like Young’s previous cookbooks this one too is crafted with spectacular photographs and elegant writing, Filled with a wealth of instruction, cultural history, personal experiences, and hard-earned advice, this the first and only Chinese cookbook to describe the optimal approaches for stir-frying meat poultry, fish, shellfish, vegetables, rice, and noodles. Young advises, for example, that when stir-frying meat, poultry, or shellfish the ingredients must be spread around the wok and seared briefly before stir-frying. She explains why a wok is preferable to a skillet for stir-frying rice and noodles and describes the distinctions among different types of woks and skillets and how they affect the stir-fry results. She categorizes vegetables by textures and instructs on their different cooking times. This expert guidance will benefit novice and experienced cooks alike. Stir Frying to the Sky’s Edge offers over 100 recipes, with classic dishes from Guangzhou (Canton), Shanghai, Fujian, Sichuan, Hunan, Beijing, and Hong Kong, such as the revered Kung Pao Chicken, Stir-Fried Ginger Beef, and Dry Fried Sichuan Beans. Further enriching the book is Young’s fascinating history of stir frying’s place in the Chinese Diaspora. She shares innovative crossover recipes that illustrate the adaptability of the stir fry technique for fusing the traditions of numerous cultures including surprises such as Chinese Trinidadian Stir-Fried Shrimp with Rum, Chinese-Jamaican Jerk Chicken Fried Rice, and Stir-Fried Bok Choy with Pancetta from France. Beyond the lessons and recipes Stir Frying to the Sky’s Edge so generously provides are the human stories of how this simple cooking technique enabled generations of Chinese around the world to eat well and with exquisite economy. Young’s research extended to such unexpected countries as Trinidad, Holland, Germany and Canada. She also interviewed Chinese who grew up in Peru, Jamaica, Burma, Malaysian, Singapore, Vietnam, Macau, India, Indonesia, South Africa, Libya, and the Mississippi Delta. With tales that illuminate the Chinese philosophy of cooking and examine the Chinese experience through the lens of stir frying, it is an invitation to understand stir-frying as an expression of cultural continuity. There is an age-old Chinese expression: “One wok runs to the sky’s edge,” which means one who uses the wok becomes master of the cooking world. As the wok user becomes master of the cooking world, so does the user of Stir Frying to the Sky’s Edge become master of the stir fry. “A stir-fry lesson from wok queen.” Washington Post. “A stirring spin around the world: masterful book adds international flavors to classic Chinese method.” Chicago Tribune. 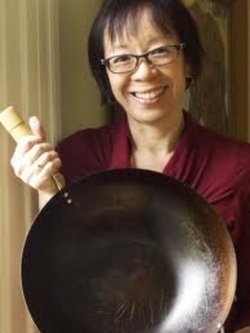 “With stir-frying, her sky’s the limit: Grace Young puts the wok to work.” Boston Globe. Grigson Award for distinguished scholarship, and the World Food Media Awards’ Best Food Book in Australia). 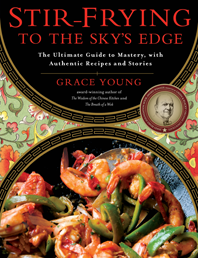 In 2008, Grace received the eGullet Society for Culinary Arts & Letters Culinary Journalist Scholarship for research for Stir-Frying to the Sky’s Edge. Young’s work has appeared in Bon Appétit, Food and Wine, Gourmet, Gastronomica, and Saveur magazine where she is also a contributing editor. She teaches Chinese cooking and always travels with her own wok. For seventeen years, Young was the Test Kitchen Director and Director for Food Photography for over forty cookbooks published by Time-Life Books. She lives in New York City with her husband.